Lately I have been thinking about why I blog. I write to reflect. I write to remember. I write to connect. I also write because I love words. Words help me make sense of the many thoughts I have swirling through my mind. Words bring order to the mostly wonderful chaos of my life. Words can bring tears and laughter. They can transport you to a different place or give you a new perspective. Words build a bridge from me to you—and sometimes back again. I also write because sitting down to think and type in the quiet of the evening helps me focus on what matters most: my faith and my family. It helps me appreciate all I have been given. It forces me to recognize the many ways I am falling short as a wife and mother—and celebrate a few successes, too. In a way, this blog is my personal Examen. I don’t always write openly about my love for Jesus, my deep affection for our Catholic faith, the wonder of being connected within a communion of saints, the miracle of receiving the Eucharist, how humbled I am that John and I are able to share our faith with our children. Maybe I should write more intentionally about what I believe. Still, even when I don’t talk about faith, I feel it is in the background, a little whispering wind, perhaps, or a ray of light. When you look at a tree you know that it didn’t just appear one day. It takes sunshine and rain and fertile soil and time and maybe even caring people to make it grow. God offers me the foundation that makes it possible for me to see the world through this lens, to embrace each day with joy and hope. And He helps me reach deep within myself to find words. Oh, to be God’s pencil. Many nights, as I’m trying to write, I have to tuck our younger son back in bed every few minutes. He always has a reason for getting up. He’s scared of a shadow. He wants to take a toy to bed. The hall is too bright. The hall is too dark. He needs another hug. He’s hungry. He’s thirsty. He’s giggling. He forgot to tell me what his friend said on the playground. He wants to call Grandma—again. Tonight I realized that I am so much like our little boy. God places me somewhere and I try to wriggle out of it. He says it’s time to sleep and I tell Him I have something better to do. He offers me what I need and I complain. I want a toy. Not that toy! I want it dark. Not that dark! Again and again, God tucks me in, knowing His plan is better than mine, but also knowing that I have free will—and might make the same bad decision again and again. My faith is far, far from perfect. I am no better a person or a Christian or a Catholic than anyone else. I don’t write here because I am trying to teach you how to live your life. I’m still trying to learn how to live mine. And I’m so honored we are on this journey—separately and together. 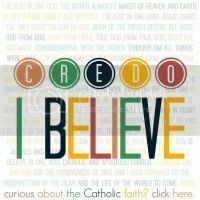 I’m participating in The Credo Project. If you want to learn more about the Catholic Church, please feel free to reach out here or by email at openwindowcr@gmail.com. I am no expert, but I’m more than happy to chat. Joining The Koala Mom and many other great bloggers for the Bloggers Fete!